Original Editors -Kellie Johnston & Molly Williams from Bellarmine University's Pathophysiology of Complex Patient Problems project. "Schizencephaly is a developmental birth defect. It is characterized by abnormal slits or clefts in the cerebral hemispheres of the brain. People with clefts in both hemispheres commonly have developmental delays, delays in speech and language skills, seizures, and problems with brain-spinal cord communication. Individuals with clefts in only one hemisphere are often paralyzed on one side of the body, may have seizures, and may have average to near-average intelligence. Other signs and symptoms may include an abnormally small head (microcephaly), hydrocephalus, intellectual disability, partial or complete paralysis, or poor muscle tone (hypotonia). Treatment generally consists of physical therapy and drugs to prevent seizures. In cases that are complicated by hydrocephalus, a surgically implanted tube, called a shunt, is often used to divert fluid to another area of the body where it can be absorbed." “Data on Schizencephaly were extracted from six regional congenital anomaly registers. Results Thirty-eight cases of Schizencephaly were identified in 2,567,165 live births and stillbirths, giving a total prevalence of 1.48/100,000 births (95% CI, 1.01-1.95). Eighteen (47% (95% CI, 31-63%)) of the 38 cases were identified antenatally. No affected fetus had an abnormal karyotype identified. A high proportion of cases of Schizencephaly occurred in younger mothers: 63% were aged 24 years or less, significantly higher ( P &lt; 0.0001) than the corresponding proportion (26%) of mothers in England and Wales. The majority of cases were not identified until after 22 weeks of pregnancy. Additional anomalies associated with vascular disruption sequences were found in eight cases which had septo-optic dysplasia or absent septum pellucidum, one of which also had gastroschisis." Patients with Schizencephaly may present very differently depending on the degree and size of the cleft. Developmental delays are common in these patients and the level of delay can range from mild to severe. If the clefts are either bilateral or open-lip, the delay will typically be more severe. 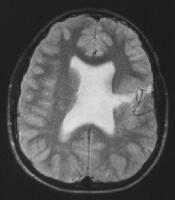 Hydrocephalus or increased pressure in the brain due to the accumulation of fluid may be present. Microcephaly or the presence of a smaller head may be a clinical presentation as well. The patient may have paralysis of the limbs which might be on one or both sides of the body dependent on the location of the cleft. Increased tone known as spasticity or low-tone (hypontonia) may be present as well. While the above characteristics may be present in some patients, other patients may present with only seizures. These seizures usually occur prior to the age of three, however some patients present with them later in life. Individuals with Schizencephaly can have microcephaly(small head) which leads hydrocephalus. Hydrocephalus is increased pressure inside the brain due to fluid accumulation. Patients with Schizencephaly may only have seizers and they normally present before the age of three. However, patient may present later in life with their only symptom being seizers and then through brain imaging be diagnosed with Schizencephaly. Paralyis is common in individuals with Schizencephaly. Depending on where the location of the cleft is paralysis maybe bilateral or unilateral. Schizencephaly often presents with abnormal muscle tone. They can have hypotonia or spasticity. These individuals will most likely show developmental delay which can vary from mild to severe(associated with bilateral and open-lip clefts). This can lead to mobility impairments, especially with ambulation. Anticonvulsant drug therapy is used for the treatment of seizures that are often a sign/symptom of patients with Schizencephaly. Due to the fact that there is no cure for Schizencephaly at this time the medications are used to treat signs and symtpoms the patient presents with. Schizencephaly is best diagnosed by magnetic resonance imaging (MRI) due to its ability to differentiate between white and gray matter. MRI also has the ability to provide imaging in more than one plane which is beneficial for this diagnosis. MRI’s are able to differentiate schizencephaly from porencephaly by identifying gray matter lining the clefts which is the pathognomonic finding. An MRI has the ability to obtain the most complete data which leads to an accurate prediction of the neurological outcome. However, MRI’s have decrease accuracy when the patient exhibits movement and due to Schizencephaly being a neonatal diagnosis, some children may be required to be sedated. CT scans can be used to diagnose Schizencephaly due to the high cost of MRI’s but are not first choice. 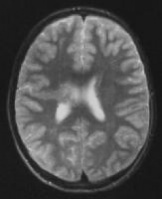 Schizencephaly MRI by Close K, Smirniotopoulos J. As previously mentioned, the cause of schizencephaly is unknown. In fact, multiple causes have been proposed. While some patients with schizencephaly have been found to have mutations in the EMX2 gene, some investigators believe this cause is very rare. Other studies report a detection of mutations in the SIX3 and SHH genes. While the cause is unknown, a hereditary (genetic) component has been found among siblings. "In a study published in 2005, the authors found that there was an association with young parental age in isolated schizencephaly (occurring alone without other abnormalities); this was also seen in mothers, but not fathers, of non-isolated cases. Monozygotic (identical) twins may also be at increased risk for schizencephaly. One third of cases they studied had a non-CNS (central nervous system) abnormality, over half of which could be classified as secondary to vascular disruption (disruption of blood flow or supply during development), including gastroschisis, bowel atresias (absence or closure of part of the intestines), and amniotic band disruption sequence. Other apparent rare causes included chromosomal aneuploidy (extra or missing chromosomes), non-random associations (occurring with something else more often than due to chance alone), and unusual syndromes." Other suspected causes include infection, injury to the brain during the second trimester of pregnancy, or poor blood flow causing stroke. Schizencephaly is a neurological condition. If Schizencephaly presents in severe form systems such as the cardiovascular, pulmonary and integumentary systems will be affected due to the immobility of the patient. Surgical removal is used as medical management when anticonvulsant drug therapy is unable to control the patient’s seizures. A surgical shunt maybe indicated if a complication of hydrocephalus is present in which the pressure of fluid accumulation needs to be relieved. There is no current evidence for Physical Therapy in the treatment for Schizencephaly. Schizencephaly is a congenital disease; symptoms tend to be invariable which leads to little recovery. However, Physical Therapy has recently become a useful resource to help these individuals relieve their symptoms of spasticity or paralysis and improving mobility and ambulation. It is important for Physical Therapist to recognize signs and symptoms of Schizencephaly and properly refer them out to receive appropriate diagnosis and then continue treatment for impairments they are faced with. Epilepsy can be a differential diagnosis due to the seizure activity. Seizures may be the only symptom a Schizencephaly patient presents with. Cerebral Palsy can be a differential diagnosis due to spasticity, paralysis of a limb (especially if it is one sided) and developmental delay as their primary signs and symptoms. Another developmental disorder that often gets confused with Schizencephaly is Porencephaly. Porencephaly is due to early injuries in the developing fetal brain and results in injured brain tissue that consequently dissolves and fluid filled areas are left in the remains known as porencephalic cyst. These cysts can be confused with the clefts seen in Schizencephaly. Schizencephaly is known as a primary disorder of development, whereas, porencephaly is secondary to brain damage but this difference is not exclusively clear. Again, imaging such as a MRI is used to differentiate between Schizencephaly and Porencephaly. The difference between the two is that in Schizencephaly gray matter borders the cleft and with Porencephaly scar tissue and white matter are present. ↑ 1.0 1.1 1.2 Genetic and Rare Diseases Information Center (GARD). Schizencephaly. http://rarediseases.info.nih.gov/GARD/QnASelected.aspx?diseaseID=166#1652 (accessed 1 April 2012). ↑ 3.00 3.01 3.02 3.03 3.04 3.05 3.06 3.07 3.08 3.09 3.10 3.11 3.12 Health Line. Schizencephaly. http://www.healthline.com/galecontent/schizencephaly (accessed 30 March 2012). ↑ 4.0 4.1 4.2 Medscape. Schizencephaly Imaging. http://emedicine.medscape.com/article/413051-overview (accessed 30 March 2012).